The April meeting of the Wineaux of the Goddess Marching Band and Chowder Society took place Wednesday evening at Fab's, our home away from home. In attendance were the usual gang of picky palates: Marya Glur, Shawn Shai Halahmy, Rico Mandel, Xochitl Maiman, Debra Bizek, John Dickey, and myself, the Goddess of Wine. Our mission: Merlot! I personally love Merlot. Merlot has been kind of a "go-to" wine for me for a long time; it's lighter in tannins than Cabernet Sauvignon, a bit fruitier and more accessible in a shorter amount of time than thicker-skinned varieties. I really fell in love with Merlot in the early 1990's, when JD and I discovered Napa winery Clos du Val and their lovely Merlot. Shortly after that, we were introduced to Chile's La Playa Merlot - for a 4th of the price of the CdV - and happily quaffed our new passion. 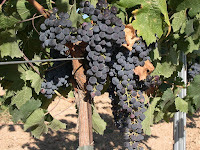 Merlot is a dark blue wine grape used as both a blending grape and for varietal wines. The name Merlot derives from the French word for a young blackbird, merlot, probably from the color of the grape. Its softness, combined with early ripening, makes Merlot a popular grape for blending with the more tannic and later-ripening Cabernet Sauvignon. According to Wikipedia, by 2004 Merlot was estimated to be the 3rd most grown variety globally, just behind Cabernet Sauvignon. 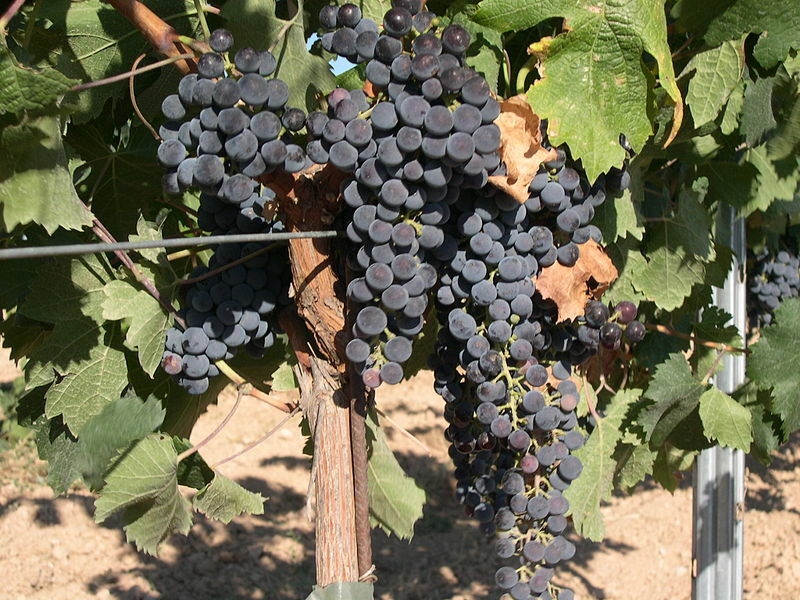 Merlot grapes are identified by their loose bunches of large berries. It has thinner skin than Cab Sauv, and is consequently less tannic, has a higher sugar content (early ripening) and lower malic acid. Merlot likes cold soil, especially clay. It needs to be well-drained and somewhat stressed. 2. 2004 Simcic, Slovenia. 85% Merlot/15% Cabernet Franc. Clear, garnet with some brown/brick tones. In the nose, earth, barnyard; Rico used the descriptor 'fruit field' to explain that he was tasting brambly fruit and wood. In the mouth firm tannins, pepper, menthol, leather, wood, with a slightly bitter finish, smoothing out with nice minerality and eucalyptus. Marya and Xochitl liked it. I thought it might pair nicely with pastas and sausage, but I wasn't really a fan. 3. 2003 WineShop at Home 'Pied Violet', Napa. I threw this in out of curiosity. WSAH is a direct sales company; it's the Mary Kay of wine. They purchase juice from premium wineries (who cannot be revealed due to non-disclosure agreements), bottle it in privately-labeled bottles, provide tasting notes and pairing suggestions, and sell it via the home party. The Pied Violet label was one of the reasons I had gotten involved with WSAH. The appearance of this wine was clear garnet with a bit of oxidation due to age. In the nose dark berries, chocolate, cherry cola, and hazelnut with a bit of French Oak. The mouth was WOW, silky mouthfeel, chocolate, lushly balanced. The overtones of basil and other herbs made me think that this was a blend of Merlot and Cabernet Franc. It made us long for steak with Bernaise sauce or wild boar. Back in 2008, when I bought this wine, I paid $18. Newer releases are higher. 5. 2011 Chateau La Rose Perrierre, St. Emilion, France. 90% Merlot/20% Cab Franc. This not-yet-released barrel sample was challenging! The color was opaque, black/purple with some magenta around the edge. The nose was dusty, closed, fruity with overtones of Bubble Yum. The mouth was seriously tannic, smoky and dusty, charred; Xochitl or Marya said it was reminiscent of charred marshmallows. 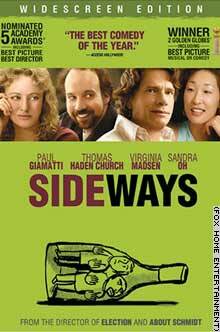 We all agreed it was very young and very dumb, and were not surprised to discover just how young it was. Later, over dinner of lamb ragout on a bed of fresh pasta, Shawn said that the wine seemed to have gotten smarter. So, that was it. An interesting and diverse group of wines. Great food. Lots of laughs. Thanks, as always, to Fab's great team: Amelia, Chef Ian and Jamie! Fun evening as always - cheers!